Objective To describe the various mechanisms of liver disease in patients with HIV infection, and to link these mechanisms to disease states which may utilise them. Background Non-AIDS causes of morbidity and mortality are becoming increasingly common in patients chronically infected with HIV. In particular, liver-related diseases have risen to become one of the leading causes of non-AIDS-related death. A thorough understanding of the mechanisms driving the development of liver disease in these patients is essential when evaluating and caring for these patients. 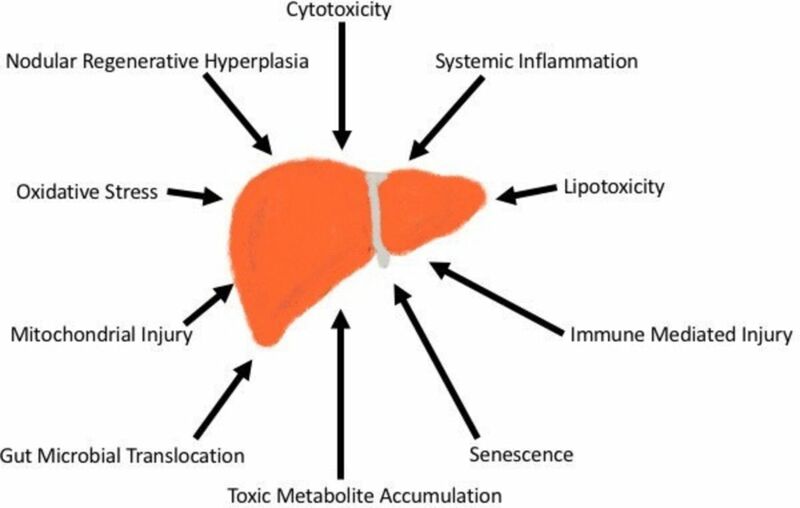 Methods The literature regarding mechanisms of liver disease by which different disease entities may cause hepatic injury and fibrosis was reviewed and synthesised. Results A number of discrete mechanisms of injury were identified, to include: oxidative stress, mitochondrial injury, lipotoxicity, immune-mediated injury, cytotoxicity, toxic metabolite accumulation, gut microbial translocation, systemic inflammation, senescence and nodular regenerative hyperplasia. Disease states may use any number of these mechanisms to exert their effect on the liver. Conclusions The mechanisms by which liver injury may occur in patients with HIV infection are numerous. Most disease states use multiple mechanisms to cause hepatic injury and fibrosis. Since the introduction of highly active antiretroviral therapy (HAART) in the mid-1990s, HIV has become a manageable (though incurable) chronic disease.1 As HIV-infected patients live longer, non-AIDS illnesses are becoming increasingly important sources of morbidity and mortality in the HIV-infected population.1 In particular, liver-related diseases are becoming increasingly prominent in HIV-infected patients. For example, 5%–25% of patients may be coinfected with hepatitis B virus (HBV),2 30% with hepatitis C virus (HCV)3 and 30%–40% of patients may exhibit signs of non-alcoholic fatty liver disease (NAFLD).4 Liver-related disease has been estimated to account for 13%–18% of all-cause mortality in HIV-infected patients and is one of the leading causes of non-AIDS-related death.5–7 Therefore, early and prompt recognition and diagnosis of liver disease in its early stages is an essential component of ensuring continued improvements in morbidity and mortality in this population. The mechanisms of liver diseases in those living with HIV somewhat depend on the function of the immune system. Data from Center for AIDS Research (CFAR) network of Integrated Clinical Systems study cohort demonstrated that poorly controlled HIV monoinfection is an independent risk factor for liver fibrosis.8 The development of liver fibrosis represents the most clinically relevant final common pathway of hepatic injury. A detailed description of the mechanisms of hepatic fibrogenesis is beyond the scope of this review. However, numerous publications that provide a detailed synthesis of this final pathway are available.9 HIV-infected patients with controlled disease (suppressed HIV RNA and restored CD4 counts) are prone to developing liver diseases from simple and common causes such as alcoholic and NAFLD, viral hepatitis, and ageing in addition to more HIV-specific processes such as HAART-related toxicity and direct injury to the liver by the HIV virus itself. While the mechanisms that cause liver injury and fibrosis in the HIV-infected patient are distinct, the patterns with which they are used by various disease states is not, with a single disease state often using a number different mechanisms in its pathogenesis. With this in mind, a broad understanding of these mechanisms of liver injury, followed by a linking of these mechanisms to the diseases that use them, may be of utility to both clinicians and investigators caring for the HIV-infected patient with liver disease. Typical mechanisms of liver disease in these patients include oxidative stress, mitochondrial injury, lipotoxicity, immune-mediated injury, cytotoxicity, toxic metabolite accumulation, gut microbial translocation, systemic inflammation, senescence and nodular regenerative hyperplasia (figure 1). Mechanisms of liver injury in HIV-infected patients. Senescence is a progressive process by which shortening of telomeres during DNA transcription leads to expression of a senescent cellular phenotype. These senescent cells display numerous derangements, most notably disproportionate secretion of proinflammatory cytokines such as IL-6 and IL-8.55 While this process of cellular ageing is present in patients without HIV, it has been observed that a number of diseases typically associated with ageing including liver disease, renal disease, bone loss, diabetes and non-AIDS cancers occur with greater frequency and at a younger age in HIV-infected patients.56–60 In the HIV-infected patient, normal ageing, possibly accelerated by chronic inflammation related to ongoing infection, is the primary disease state that acts by this mechanism. Table 1 illustrates the diversity of the mechanisms by which various disease states cause hepatic injury and fibrosis in the HIV-infected patient. While all of the above-mentioned mechanisms are important, some, such as oxidative stress, mitochondrial injury, immune-mediated injury and systemic inflammation, manifest with greater frequency and across a greater spectrum of disease states than others. Finally, as shown in table 1, a single disease state may use a number of mechanisms, with each disease effecting pathogenesis via a complex system of complimentary mechanisms of injury. While our understanding of the pathophysiology of hepatic fibrosis has advanced significantly, a number of questions regarding the interaction between these various mechanisms, as well as possible regulatory mechanisms and possible therapeutic targets remain lacking. While there have been significant advances in treating HIV, HBV and HCV, there has also been a dramatic increase in the metabolic syndrome in those living with HIV,64 which suggests that NAFLD will become an increasing problem in this patient population.65 Therefore, future studies need to focus on ways to modulate gut microbial translocation, oxidative stress and systemic inflammation. Until then, providers of those with HIV need to be mindful of the various mechanisms of liver injury.
. Pathogenesis of nonalcoholic fatty liver disease. In: Zakim and boyer’s hepatology: Elsevier Health Sciences, 2016:369–90.
. HIV and the liver. In: Zakim and boyer’s hepatology: Elsevier Health Sciences, 2016:553.
. Human kupffer cells infected with HIV-1 in vivo. J Acquir Immune Defic Syndr 1993;6:772–7.
. The Role of Inflammation and Immunity in the Pathogenesis of Liver Fibrosis. Liver Immunology. Clifton, NJ, USA: Humana Press, 2007:111–21.
. Virology and pathogenesis of hepatitis B. In: Zakim and boyer’s hepatology : Elsevier health sciences, 2016:369–90.
. Aging, inflammation, and HIV infection. Top Antivir Med 2012;20:101–5. Contributors MBK drafted manuscript. RKS reviewed and edited manuscript for final content and is primarily responsible for overall content as guarantor.